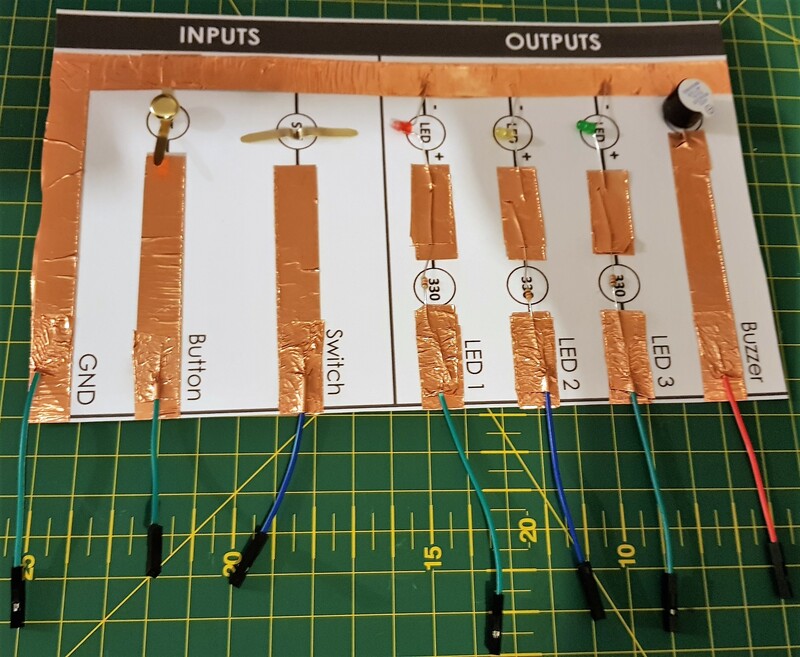 I recently published a blog post with instructions on creating a simple DIY Input/Output board for the BBC micro:bit, it received a lot of interest and a number of people have asked about using it with the Raspberry Pi. In response I have created a version of the board for the Raspberry Pi, this is detailed in this post. Print this Input-Output Board Template onto A4 card, cut in half and trim. Make a hole in the middle of the switch circle with a paper fastener. Insert a paper fastener into the hole from underneath and open out. Ensure it makes good contact with the copper tape, but will still easily pass over it. Bend the pins on one of the buzzers outwards, place in position and secure the pins in place with small pieces of copper tape. Bend the legs on the 3 LEDs outwards, lay them flat as shown in the picture, ensuring you place the LEDs the right way around, if one leg is longer it should point towards the bottom and the flat side of LED should face towards the top. Use one long strip of copper tape to secure the top legs of the LEDs. Place 3 x 330 Ohm resistors in the place and secure both the bottom legs of the LEDs and the top of the resistors in place with pieces of copper tape. Using the breadboard jumper wires, make 7 x 5cm wires with female connectors on one end and bare stripped wire at the other. 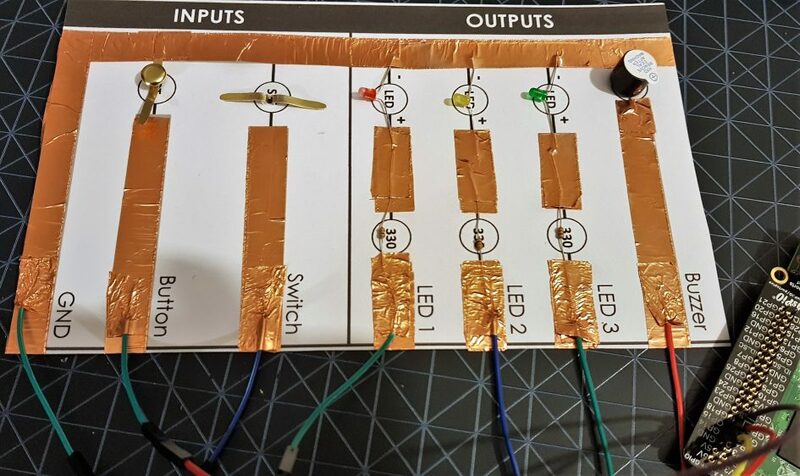 Use copper tape to secure the remaining wires to the bottoms of the GND, Button, Switch and Buzzer strips.